One important event, which occurs early after an injury, is muscle spasm. 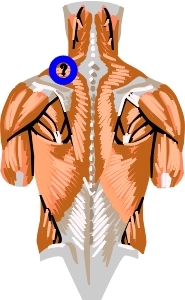 This feels like tightness in the muscles in the area, and is sometimes, but not always, painful. Treatment of the spasm is significant in the overall treatment of the problem. This is because after an initial period, if the basic injury is not fixed, the spasm forms muscle knots. Usually this happens about two weeks after the initial injury. These knots are painful, and become part of the problem. Sometimes, the pain from the muscle knots is the reason why someone first goes to get help with the problem. There is a textbook because muscle knots are the source of a large amount of pain and misery, and treating them is important. The knots form because the spasm keeps the muscle continuously "on". Normally, even when doing heavy lifting, no muscle is working continuously. Instead, as the body moves in normal activities, different muscles cycle on and off. The spasm makes the muscle work continuously, around the clock. The muscles are not designed for this continuous work. After some amount of time the muscle overloads and forms these knots. Treating spasm helps reduce this problem. Spasm occurs after other kinds of injuries, but muscle knots only become a problem when the source of the pain doesn't go away quickly. This happens most often (but not only) with injuries to the neck and back. There are several methods to treat muscle knots. Choosing among them is the job of the health-care practitioner who is working most closely with you. As discussed on the exercise page, exercise is an important method to help with the muscle knots. Often, exercise can be a supplement to the other treatments discussed. Massage therapy is a helpful treatment for the muscle knots. Therapeutic massage of this type can be uncomfortable when it is being done, but the patient is expected to feel better later. Treatment in the category called "modality", heat, cold, ultrasound, and electrical stimulation, as applied by a physical therapist or chiropractor, can help with muscle knots. Injections into the muscle knots, called trigger point injections, are another method of treatment. Acupuncture can have an impact on these areas also.